Dwayne Sloan is the Director of Principal Engineers and Regulatory Services for the Building and Life Safety Technologies Division at UL LLC (www.ul.com) where he directs the activities of other Principal Engineers and Regulatory members that support a wide variety of product areas. Mr. Sloan's focus is in the area of Reaction to Fire. He is a presenter for organizations, such as NFPA, Society of Fire Protection Engineers, Expanded Polystyrene Industry Alliance, Reflective Insulation Manufacturers Association, and others on reaction to fire topics and provides technical leadership for UL’s building materials certification services and standards development activities. Mr. Sloan serves on several NFPA technical committees and participates in various ASTM committees. He is currently the second Vice President of ASTM E05, Committee on Fire Standards. Dwayne has a Mechanical Engineering degree from North Carolina State University in Raleigh, North Carolina. During his 30 years at UL, he has worked in and led a variety of UL’s fire-protection areas, and authored several articles and publications. He was recently recognized by UL as a Corporate Fellow within the William Henry Merrill Society, named in honor of UL’s founder. Mr. Sloan can be reached at Dwayne.E.Sloan@ul.com. Insulation materials are used in a variety of different applications in commercial and residential buildings. Depending on the installation, these materials are required by code and specifications to have minimum ratings established in accordance with specified fire tests and other standards. Identifying the governing code requirements, product specifications, and test standards that apply can be quite a challenge. However, understanding these specifications and regulations is of utmost importance to achieve the appropriate levels of product performance and enhance the likelihood of acceptance of the insulation products in the marketplace. One of the common test methods applicable to insulation products in codes and specifications is ASTM E84 (UL 723), Standard Test Method for Surface Burning Characteristics of Building Materials. ASTM E84 (UL 723) includes a fire test method that evaluates the surface-burning characteristics of building materials, such as wall and ceiling surface finishes and insulation. The purpose of this test is to determine the relative burning behavior of the material by observing the flame spread along the specimen and the smoke developed during the test, and then documenting these using 2 ratings (the flame-spread index and the smoke-developed index). It is important to understand the intent of the test and the performance indexes in order to help end users and code authorities achieve code-compliant installations with minimal delays or problems. This understanding is essential because all the model codes and installation standards listed below contain requirements for insulation products to achieve specific flame-spread and smoke-developed indexes when tested to ASTM E84 (UL 723). In addition to these common code and installation requirements, there are several specifications, such as ASTM, for insulation products that contain requirements for surface-burning characteristics, flame-spread, and smoke-developed indices. The National Insulation Association’s (NIA) Insulation Materials Specification Chart (https://tinyurl.com/spechart) is an excellent reference for the specific surface-burning characteristic values that apply to various insulation products. In order to better understand the relevance of ASTM E84 (UL 723), it is important to understand the events that led to the development of the test and the code applications that require products to comply with this standard, as well as to know how the test is performed. At the beginning of the twentieth century, major fires in U.S. buildings raised public concern and demonstrated the need to address and regulate the burning characteristics of building materials. Fires at the Boston Cocoanut Grove Nightclub, La Salle Hotel (Chicago), and Winecoff Hotel in Atlanta resulted in over 650 deaths. These 3 fires had a common theme: rapid flame progression along the surfaces of the interior finish greatly contributed to uncontrollable fire spread. There was a dire need to manage these types of building fires through passive fire protection and regulating material characteristics. 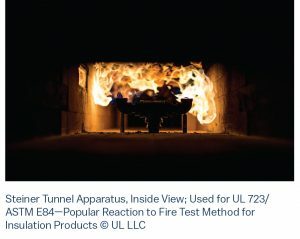 By the 1940s, research work at UL resulted in this prevailing “reaction to fire” test method using a 25-foot-long tunnel to characterize the surface-burning fire and smoke characteristics of interior finish materials. The 25-foot tunnel became known as the Steiner Tunnel, named in honor of the primary UL engineer, Albert J. Steiner. Its prominence in the fire-protection community was based on its ability to provide cost effective, repetitive testing and use of a sample size that could characterize interior finish materials used in actual installations. After a few refinements, the first formal test method was published as UL 723—Standard for Test for Surface Burning Characteristics of Building Materials by UL in 1950. The test method was formally adopted by American Society for Testing and Materials (now ASTM) in 1961. The National Fire Protection Association later adopted the method as NFPA No. 255 in 1955. Today, this method is currently described in the 11th edition of UL 723 and is also commonly known as ASTM E84. The regulation of rapid progression of fire on interior finish materials is as relevant today as it was nearly 70 years ago, as the need for accurately assessing interior materials has not diminished. A more recent example of the need for interior material fire assessment is The Station nightclub fire that occurred in Rhode Island in 2003. In this fire, rapid progression of flames on the interior materials, which were not examined to proper standards, led to the building being engulfed within minutes. 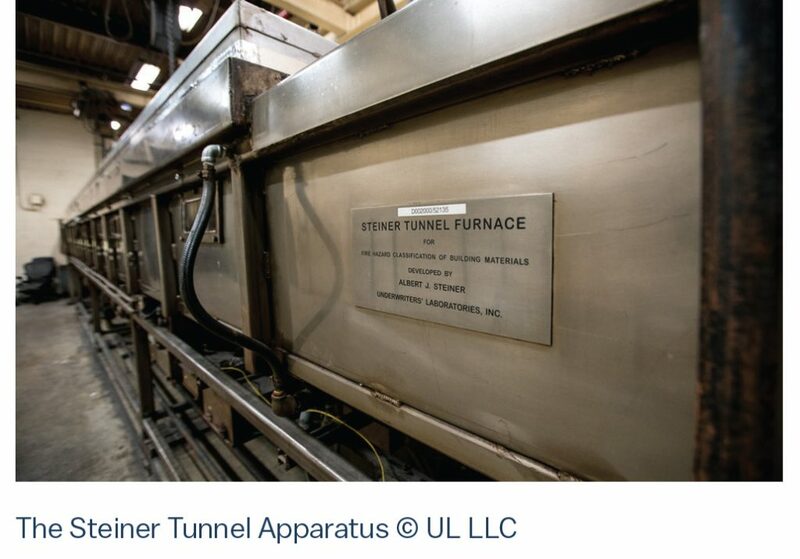 The tunnel apparatus is constructed such that materials under testing have an exposed area of 18 inches wide by 24 feet long, up to a thickness of approximately 5–6 inches, maximum. 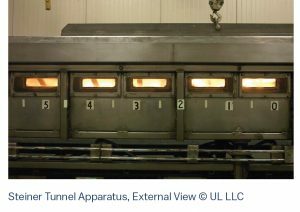 The test is conducted with the sample mounted in the “ceiling” position of an enclosed tunnel furnace measuring 18 inches wide by 12 inches deep by 25 feet long. Two burner outlets, spaced 8 inches apart, deliver a nominal 5000 BTU/min., 4 ½-foot flame to provide the ignition source to the underside of the mounted specimen. The test continues for a 10-minute duration. A controlled inlet draft of 240 feet per minute facilitates horizontal flame propagation throughout the test. With all of the controls set for the tunnel operation, the room is darkened and the gas burners are ignited. Observers record the distance and time of maximum flame-front travel through the tunnel observation windows. Flame-front advancement is recorded at the time of occurrence or at least every 30 seconds, if no advancement is noted. The test continues for a 10-minute period. A light and photoelectric cell, mounted in the exhaust duct, records smoke obscuration during the test. Flame-spread and smoke-developed indices are reported in comparison with calibration materials of red oak lumber and fiber-cement board. Red oak propagates flames to the end of the tunnel in approximately 5 ½ minutes and generates a flame-spread index of approximately 90. A smoke-developed index of 100 is assigned for red oak. Fiber-cement board generates flame spread and smoke developed indexes of 0. It is important that the test specimens be representative of the materials that the test is intended to examine and representative of the products intended to be installed in the field. For sample selection, there are several considerations, such as sample composition, thickness, density, and joining characteristics. Products to be tested are mounted according to their product types. Sometimes the products are considered “self-supporting,” so they simply rest on the ledges of the tunnel. In other cases, the specimens are supported by rods and/or wire or secured from the back side. Several mounting practices listed below have been developed through the ASTM process to facilitate consistent mounting of various product types when testing to ASTM E84 (UL 723), including ASTM E2231 for pipe and duct insulation materials, ASTM E2599 for reflective insulation, and ASTM E2988 for flexible fibrous glass insulation for metal buildings. This test method can provide data on composite materials, such as batt and blanket insulation products comprised of fiber glass insulation, adhesives, and facings, and the method is also capable of providing test results on the individual components of a composite product, such as the individual fiber glass insulation, adhesives, and facings. One misconception is that the individual component values can be used to represent the composite material for compliance with ASTM E84 (UL 723) regulation or specifications. It is important to understand that products, such as batt and blanket insulation, are tested as a composite material. Experience and historical data has shown that as a rule, component values cannot be considered as worst case or additive to represent the composite product. In other words, 3 components with a flame spread of 5 will typically not yield a flame spread of 5 for the composite. Similarly, 3 components with a flame spread of 5 have not been shown to reliably predict a flame spread of 15 for the composite. This is an important distinction because combining materials can change the overall behavior of the final composite. This means that, even if the insulation itself were certified, the addition of adhesive and facing may change the behavior of the composite when exposed to fire. Only testing the composite product will demonstrate the actual values. The requirement to test composite materials is reflected in ASTM E84 (UL 723), as well as the mounting procedures mentioned above. Often, the easiest way to avoid this issue is to look for finished materials with a reliable third-party certification. 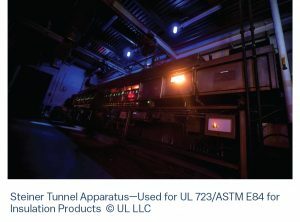 The Steiner Tunnel test method, as described in ASTM E84 (UL 723), is one of the most popular “reaction to fire” test methods within the U.S. This method has been used for decades with success to assess the comparative surface-burning characteristics of building materials. 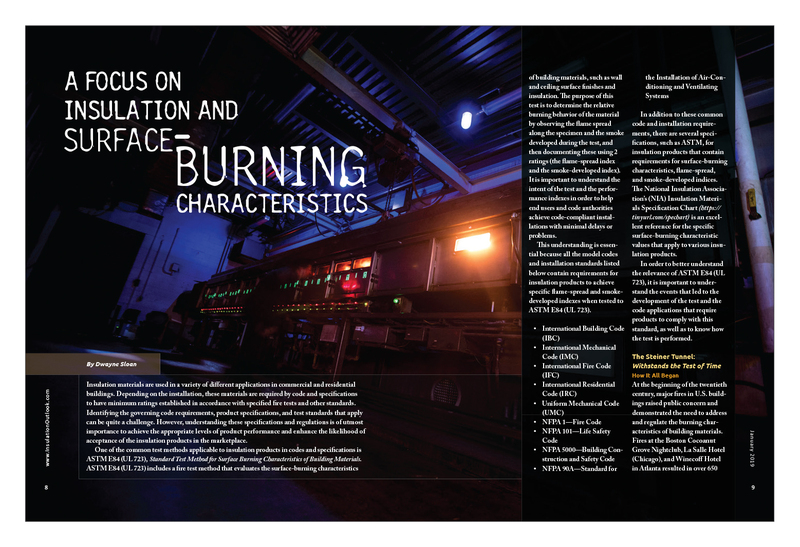 The selection of materials with appropriate, code-compliant results has proven to be a useful tool in mitigating the hazards associated with flame propagation on interior surfaces. We previously listed several model codes and installation standards that require insulation products to comply with surface-burning characteristics requirements determined in accordance with ASTM E84 (UL 723). While we do not have the opportunity to explore all of the above codes, let’s explore some of the IBC applications that require insulation to have ratings established in accordance with ASTM E84 (UL 723). 720.3—Exposed insulating materials are also required to have a flame spread index of not more than 25 and a smoke-developed index of not more than 450, except for cellulosic fiber loose-fill insulation with a smoke-developed index of not more than 450 when tested in accordance with CAN/ULC S102.2. 720.4—Loose-fill insulation, other than loose-fill cellulosic insulation, that cannot be mounted in the ASTM E84 or UL 723 apparatus without a screen or artificial supports, are required to have a flame spread index of not more than 25 and a smoke-developed index of not more than 450. IBC Chapter 8 contains the performance requirements for controlling fire growth and smoke propagation within buildings by restricting interior finish and decorative materials. The provisions of this chapter require materials used as interior finishes and decorations to meet a Class A, B, or C fire performance based on the relative fire hazard associated with the occupancy. The Class A, B, or C fire performance of the material is evaluated based on test standards ASTM E84 (UL 723). The required level of performance for a Class A, B, or C fire performance is defined in Chapter 8 of the IBC, shown below. 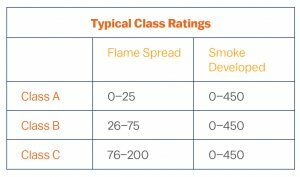 When used in exposed plenums the IMC, UMC, and NFPA 90A in general will require insulating materials to comply a flame-spread index of not more than 25 and a smoke-developed index of not more than 50. Foam plastic insulation is governed separately by these codes (for example Chapter 26 of the IBC). In general, foam plastic insulation and foam plastic cores of manufactured assemblies shall be tested and labelled as having a flame spread index of not more than 75 and a smoke-developed index of not more than 450 when they are tested in the maximum thickness intended. Throughout these codes, there are several more required fire response tests other than ASTM E84 (UL 723) for surface-burning characteristics. For example, just to name a few, insulation materials used in fire-resistive construction are required to be tested within the assemblies in accordance with UL 263 (ASTM E119); insulation materials used in roofing assemblies are evaluated in accordance with UL 790 (ASTM E108); insulation materials defined as noncombustible are examined by ASTM E136; and insulation products evaluated in exterior wall construction are tested in assemblies in accordance with NFPA 285. Code authorities rely on UL Product Certifications to show compliance with the ASTM E84 (UL 723) flame-spread index and smoke-developed index requirements. This third-party certification demonstrates an ongoing commitment to safety and quality. For some specific products, such as faced blanket insulation, third-party certification can also prove beneficial because it demonstrates that the composite material— the insulation, adhesive, and facing—has been evaluated and certified rather than the individual components alone. Certification by UL means a product has been evaluated, complies with UL’s requirements, and is manufactured under a Follow-Up system, meaning the certification extends beyond testing. This Follow-Up Program allows UL to verify that products remain compliant with requirements and are produced in a manner representative of the construction of the product that was originally evaluated and certified. UL’s Classification Mark on insulation products—“UL Classified” is the applicable term—is the manufacturer’s representation that samples of that product have been evaluated as to their surface-burning characteristics in accordance with ASTM E84 (UL 723). 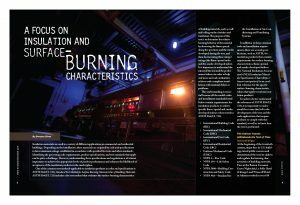 Products certified for ASTM E84 (UL 723) surface-burning characteristics can be found online on in UL’s Product Spec database at http://productspec.ul.com by selecting Product Type, and entering surface burning. A link to this database is also available on NIA’s Specs and Codes page at https://tinyurl.com/ybdef8td. The many advantages of third-party certification lead some building material product manufacturers to make it company policy to obtain UL Classification for their products to minimize the possibility of non-acceptance by code authorities. Additionally, many purchasers, building designers and building owners understand UL-Certified materials can be counted on to perform as expected. Specifying UL-Classified building materials also means the materials will automatically come with third-party quality control which, in turn, means UL will establish a field report to determine the nature of the nonconformance and take appropriate corrective action should an issue occur.